My day job is selling ERP software for Oracle. 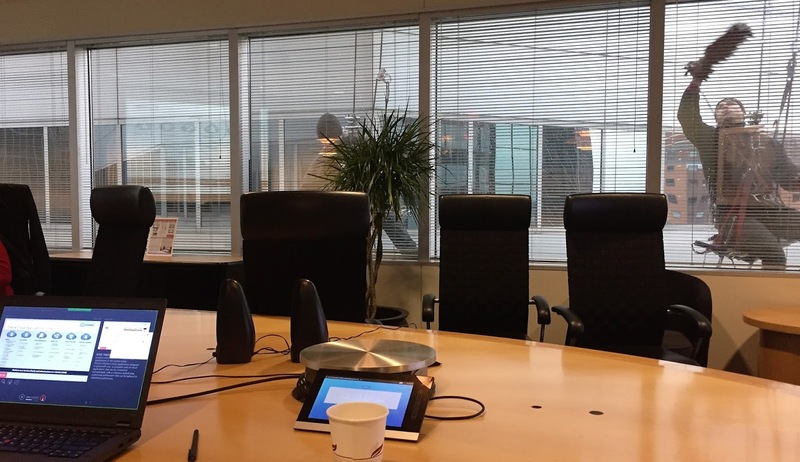 On Friday, I was having a meeting with a CFO, VP of Accounting, and CIO from a local insurance company in one of our nicer conference rooms. We had done a lot of preparation for this meeting and were trying to make sure everything was perfect for the presentation. The clients were in the meeting in person, but our main presenter was calling in on a conference line. The meeting was going well and the customers were listening intently. All the sudden, we started hearing some loud bangs outside which is not a very common occurrence on the 9th floor in downtown Minneapolis. I quickly realized it was the window washers, which wasn't a big deal except they kept making these loud bangs and were slapping their suction cups on the windows. Nobody said anything and we kept going with the meeting. But it was just awkward enough of a situation that I thought I should snap a couple of pictures to remember the occasion. I came home from work on Friday and was surprised to find Miss Sheri and our neighbor, Jim, had removed most of the boards from our deck. She had told me she was going to replace a couple of boards, but I guess once they started they just couldn't stop themselves and decided to replace all the boards. They're a lot more ambitious than I am. Friday night, our friends the Walters invited us over for a bonfire since it was such a lovely evening. We just couldn't pass on the opportunity to burn things. We were celebrating the fact that Luke and Jackson both made their decisions for college and have decided to room together at Minnesota State Mankato. Luke will be studying business and I'm pretty sure Jackson said he'd be studying science. Congratulations, fellas! On Saturday night, we invited Jim out to Benihana to partially thank him for all his help he's given us this year. Aside from countless projects around the house and yard he's helped Sheri tackle, he was also instrumental in helping Luke and Avery complete their eagle scout projects. Thanks, Jim!! Jim told us he also grew up on a farm like Miss Sheri, which is probably why they are so compatible for taking on big projects together. I on the other hand am not compatible with them. When I discover a project around the house or yard, my first thought is "Can Sheri fix that?" My second thought is, "If Sheri can't fix that, how much is that gonna cost me?" But lucky for me, Sheri is willing to tackle the big projects and Jim is kind enough to help her figure out the best way to do them. They decided the frame of the deck was solid enough to keep, but needed to be raised. They are then going to replace all the boards. Which is nice. Pretty soon it will look like we have a brand new deck!